You would think that since we don't have normal jobs and kids in any form of school that there wouldn't really be any transition to summer for us. Wrong! I don't really know why, but things have gotten busier for us the last week or so. We do have Bible school, little J's birthday, and my sister's wedding all coming up the same week. And then we have the SBC in Greensboro before that. At least Bible study is over for Jonathan and me until September. Nana and Papa came to stay with us over the weekend, and they were nice enough to bring us a not new but much better than ours because it doesn't sink in and make you roll to the middle matress and box springs. Yay! They also bought Jonathan one of those little plastic pools from the $10 store. Yes, we have a $10 store--nothing over $10. Anyway, he's loving that and doesn't want to stay out so far. Here are a couple of pics I wanted to share. The first one is Nana giving Jonathan kisses at BoJangles. What's a trip to Nashville without Bojangles? 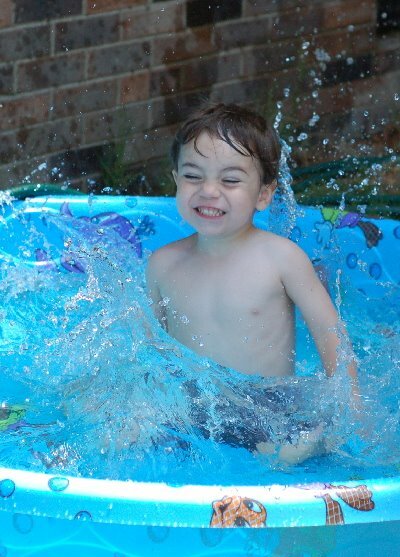 This is Jonathan in his new pool. He loves to splash. He especially enjoyed trying to splash Henry!